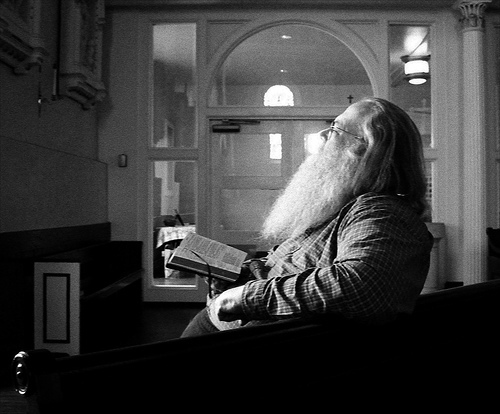 St. Vincent is a scripture-based community. The community’s commitment to scripture is reflected physically in the Altar Bible that is enshrined on either side of the tabernacle on the high altar. Word and Scripture – these are the two pillars of our faith. Work on the Altar Bible was begun several years ago in conjunction with the creation of the altar and ambo. Since no such Bible existed, an over-sized printer was purchased, and the text was produced page by page. The Bible is portfolio-size so that it can be read easily from the ambo. It has the original language of the scripture (either Hebrew or Greek) on the right page, with corresponding translation into English on the facing (left) page. The Bible consists of twenty four books, bound in baby buffalo hide with St. Vincent’s great seal on the front of each. A gold inscription on the spine of each book tells what the book is. The Tanakh (whose original language is Hebrew and reads right to left) is housed on the right of the tabernacle. 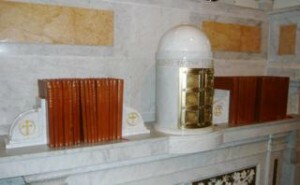 The Christian scriptures and the Apocrypha (whose original language is Greek and reads left to right) is to the left side of the tabernacle. Original illustrations by Sheila Waters are bound into the four Gospels and the five books of the Torah. 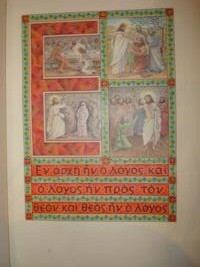 These full-size illustrations continue the tradition of the Church of supporting artists and making books beautiful works. During all services, the scripture is read from the Altar Bible and proclaimed from the ambo.